Martyn and Debbie jumped at the chance to buy this property in North Somerset. The existing bungalow, with its glorious views overlooking the Mendips, was crying out for a total redevelopment to turn it into a contemporary, two-storey family home. They knew that, with some work, it would be a great house for entertaining friends and family. They originally planned to demolish the bungalow and build a new house from scratch, but instead, worked with architect Simon Corbett, who shared their vision for creating a Modernist-inspired home. 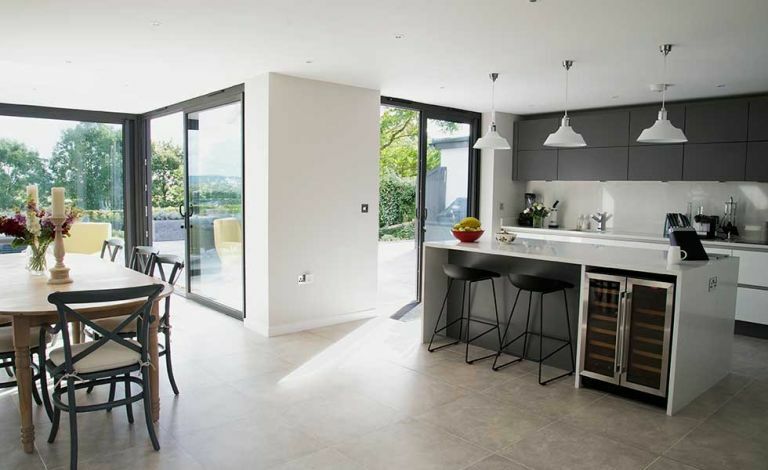 An extension and remodel has created a large kitchen-living-diner, and added bedrooms to the property, all within permitted development. Find out what they did next, then browse through more real home transformations. Find out more about extending a house in our guide.